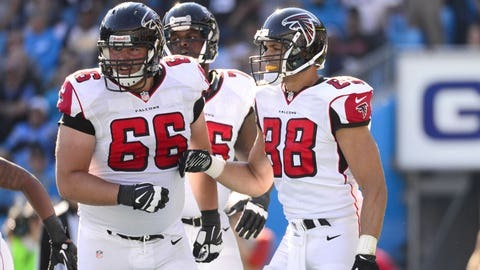 The Falcons have had their share of hits and misses in the last few years, including tight end Tony Gonzalez (far right) and 2012 first-round pick Peter Konz (66). An offensive line that struggles to pass protect and run block, a defense that is far too porous and allows too many explosive plays and too little depth overall. And while injuries to key personnel – wide receivers Julio Jones and Roddy White, starting left tackle Sam Baker, defensive end/outside linebacker Kroy Biermann, linebacker Sean Weatherspoon and running back Steven Jackson — have proved a major obstacle, the seeds for this deflating season were sown years ago with a series of misjudgments in free agency, the first of which came in March 2010, along with issues in developing offensive linemen. Economists use the term opportunity cost, which fits in reference to the Falcons’ issues in free agency. The Merriam-Webster online dictionary defines it as "the opportunities forgone in the choice of one expenditure over others." In terms of signing cornerback Dunta Robinson, defensive end Ray Edwards and the failure to lock up cornerback Brent Grimes, the Falcons have cost themselves dearly and have ended up paying the price this season. General manager Thomas Dimitroff has had some major successes in acquiring veteran players, notably trading for Tony Gonzalez and signing running back Michael Turner. However, by cutting Robinson after three years of a six-year contract and allowing Grimes to sign with Miami for the relatively inexpensive sum of $5.5 million (one-year pact), the Falcons elected to use both first- and second-round picks for 2013 — a season that began with the expectations of advancing to a Super Bowl – on cornerbacks. As a result, Atlanta could not use those picks on other areas of vital need. Such as the offensive line, an impact defensive end for the left side or a playmaking linebacker. In addition, the Falcons have been forced to go without the services of a high-end left defensive end, arguably one of their weakest positions on the depth chart. While a case can be made for first-round cornerback Desmond Trufant on the NFL’s all-rookie team, second-round pick Robert Alford has suffered through his share of growing pains. Meanwhile, Grimes has gone on to have an elite-level campaign. Unable to reach a long-term deal with Grimes, a Pro-Bowler in 2010, the Falcons used their franchise tag on him in 2012 (paying out $10.1 million). Robinson, who played press coverage his first six NFL seasons (Houston), never was great fit for the style the Falcons employed under Brian VanGorder, the team’s former defensive coordinator. Robinson improved last season in Mike Nolan’s first season as defensive coordinator, but the team ultimately felt his cap number was far too high to keep him given the results. Edwards stands out as the low point in Dimitroff’s tenure. Signed to a five-year, $30-million deal ($11 million guaranteed) in July 2011, he played in 25 regular-season games and one playoff tilt, producing a total of 3.5 sacks. His attitude and productivity proved such a toxic mix that the Falcons cut him last season after a Week 10 loss to the New Orleans Saints – the final game of his career. In terms of the offensive line, three players have struggled to fill the void left by players who were holdovers from previous regimes. After winning the starting job at right guard in 2011, Garrett Reynolds has never been able to hold down that spot. He lost it after seven games in 2011, got injured in 2012 and then lost his starting job after 10 games this season. Perhaps most worrisome is the status of 2012 second-round pick Peter Konz, who has lost his job at center â the reason why the team elected not to offer a contract to the long-time starter at that position, Todd McClure, forcing McClure into retirement. The Falcons have tried Konz at right guard, the position he played well enough as a rookie, but have removed him at times for Reynolds or Harland Gunn, an undrafted free agent. The status of Konz and Baker, who has struggled throughout his career with injuries, loom as major questions. Lamar Holmes, last year’s third-round pick, has been forced to play much of the season at left tackle but could end being a serviceable right tackle. Views on whether the Falcons face a short-term or a long-term fix vary. Certainly, if the offensive line doesnât improve over this seasonâs performance â last in the NFL in rushing and having allowed the 11th most sacks in the league — it’s hard to imagine a huge immediate improvement. Perhaps the amount of experience the rookies on defense have received will pay off. But if it doesn’t and the Falcons cannot add the right pieces in either free agency or the draft, a dramatic improvement will be a lot to ask. All of it bodes for an uncertain future.